Happy Friday! What a week it's been, but most importantly, we have a new little royal bundle to keep up with. Kate never disappoints with her modern spin on the classics and what an adorable dress she chose to introduce her royal babe to the world. 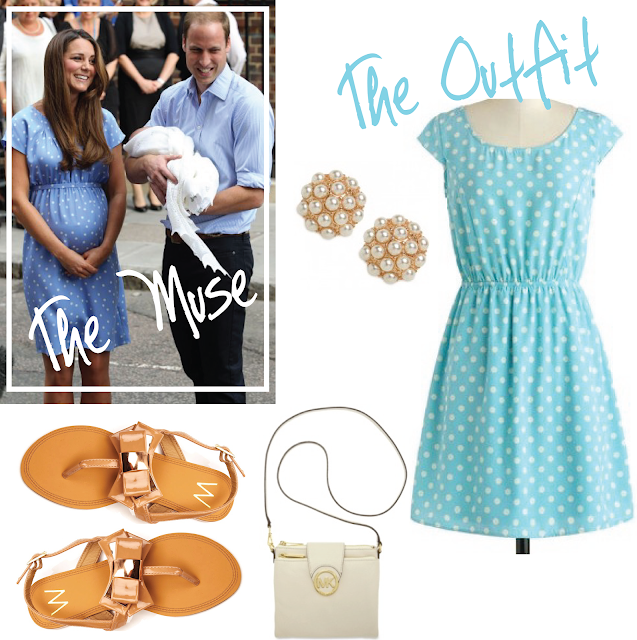 I couldn't resist making the Duchess my muse for this week's Fashion Friday Style Crush. Is this sweet little number not a dead ringer for Kate's darling dress? And how cute are these sandals? Bows and Pearls and Polka Dots? I'm in love! Have a lovely weekend, dolls! Linking up with Long Distance Loving for Friday's Fancies. Brilliant post idea & the dress is a perfect match! I love it! I was hoping someone would post this crush. She is the queen of Babetown. Loving this post! You creation is super cute. Don't you just love how she gave a nod to Diana taking home Prince William ... such a cute and fun idea!